1) Quality is determined by our customers and means understanding and surpassing customer expectations. 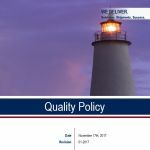 Quality is a subjective perception of each customer especially as the weighting of quality-relevant factors can differ. Thus, Bremer Lloyd delivers customized services with the highest quality standard which will meet or exceed our customers’ expectations and leave them with a positive experience. This is what we call the “Bremer Lloyd Approach”. 2) Quality starts at the management level. Managers act as role model with respect to the commitment to quality. 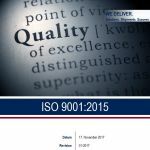 This responsibility is particularly evident in leading by quality targets, communication quality issues and building quality competencies. In addition, the Bremer Lloyd quality manager supports the management as consultant and business coach and independent controller. 3) Quality affects all employees. A crucial factor for quality are the people who work at Bremer Lloyd. To ensure that the employees have the expertise and capabilities to perform their job in a high-quality manner Bremer Lloyd analyzes skills for quality-related tasks, identifies individual gaps and develops suitable trainings in order to close existing gaps. 4) Quality already starts at our suppliers. As most of Bremer Lloyd services rely on the performance of our subcontractors we at Bremer Lloyd have a broader view on our scope by including the performance of subcontractors into our understanding of quality. Our consistent supplier management approach creates the conditions for this matter and ensures our competitiveness. 5) Quality is based on measurability and transparency. What gets measured gets done. For Bremer Lloyd this means we focus on our key performance indicators to ensure and enhance the standard of our services. 6) Quality requires continuous improvement. Quality is not a one-time goal. Quality is a process that systematically monitors our services and tries to improve these continuously. We at Bremer Lloyd concentrate on this process where quality is the outcome. The loyalty of our customers is the result of our high-quality services. 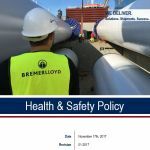 The health and safety policy of Bremer Lloyd depends on the zero-accident approach. It places the safety and health of all involved parties over the other QHSE goals. Furthermore, despite of high statistical values, only actions were undertaken, which do not cause accidents or near misses. All near misses are recorded, analysed and appropriate counteractive measures are initiated. For the unanticipated case of an emergency, we have developed a professional “Emergency Contingency Plan”. By calling telephone number +49 421 33928-11 a 24/7 on-call duty is contactable. Bremer Lloyd is aware of its environmental responsibility. Sustainability is an important factor for the transport logistics sector. The reason for this is that almost every means of transportation, due to the combustion of fuel, is liable for CO2 emissions. Our goal is to minimise the impact on the environment by a continuous reduction of CO2 emissions. We also pose this requirements to our partners. CO2 emissions for the transport of 1 ton per 1 kilometre.